Another trip by the GMA TV born to be wild team from the Philippines saw them fishing with us at the Mae Klong River at Samut Songkran. 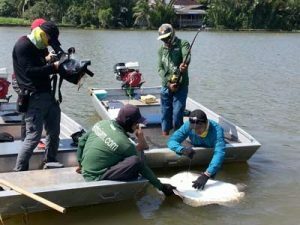 After visiting Bungsamran a few days before and getting some great footage of Mekong Catfish the TV crew now turned their attention to the Giant freshwater stingray. During the early part of the day the guides fished at various parts of the river without any action. A move further downstream saw one of the floats indicate that the Giant freshwater stingray were in the area and a short battle followed which saw a small stingray duly landed without incident. The Giant freshwater stingray was identified as being a small male and was estimated to weigh 30 kg’s. Shortly after another one of the floats burst into life and another Giant freshwater stingray was hooked. The stingray was landed after a short but spirited battle and was quickly brought into the boat for examination. Once again the Giant freshwater stingray was identified as being a small male with an estimated weight of 35kg’s. The GMA TV team continued fishing at the Mae Klong River for a further few hours but failed to land any more stingrays.